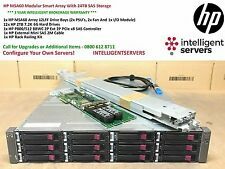 HP MSA60 Modular Smart Array 2U 10TB HDD 1x SAS I/O Module. The HP StorageWorks 60 Modular Smart Array enclosure is a 2U Serial Attach SCSI (SAS) disk drive storage enclosure supporting 3.5" SAS or Serial ATA (SATA) drives. The HP StorageWorks 60 Modular Smart Array enclosure is a 2U Serial Attach SCSI (SAS) disk drive storage enclosure supporting 3.5" SAS or Serial ATA (SATA) drives. This enclosure is designed to support 3.5" Universal SAS or SATA hard drive form factors. 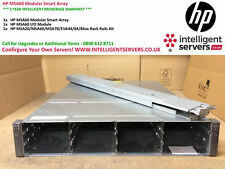 HP MSA60 Modular Smart Array With Rail Kit. 12x 3.5" SAS/SATA Hard Drive Bays. 1x Rail Kit - 356906-001. 2x Fan - 339116-002. We provide free Technical Support over the phone if you're having any installation or other techincal problems with our products. HP MSA60 12 Bay Disk SAS / SATA Array With I/O Module. Model: HP MSA60. 1 x HP MSA60 - 12 Bay SAS SATA Storage Array With 1 x SAS I/O Module (SP# 399049-001). HP P/N: 418408-B21. HP StorageWorks MSA60 with 12 x 1TB (508011-011), 1 x I/O module and 2 x PSU. Model: MSA20, MSA60, MSA70. All of our rack server rails are fully tested before dispatch. And if this isn't possible, or is unsuccessful, you have the right to receive a price reduction. General Interest. (HP StorageWorks MSA60. 1 x I/O Modules (399049-001). This item has. 3) Wire transfer- from all countries. 2) Cheque –. No rack kit. Fan Module (DL380 G5, MSA60). HP Fan - MSA60/MSA70/M6412. Ending Soon. New Arrivals. QUICK LINKS. we do not take any responsibilty after this. Monitor & TV. Why Choose Us! All components have been tested and are in good condition. MPN 448062-B21. Condition: Used / Working pulls. However we may use our discretion also to provide the safest and best service. With your protection in mind:--. Location Code: SC UNDERREDSTAIRES. Right of cancellation does not apply to audio or video recordings or computer software if they have been unsealed. New 399053-001 - HP StorageWorks MSA60 USB UID. We do not take any responsibilty after this. QUICK LINKS. Monitor & TV. Desktop PC. PC Components. Why Choose Us! HP's Part Number: 399051-001 / 012506-001. HP's AS Number: 012504-001. HP's DG Number: 012505-000. If there are any problems, we are unable to follow up on progress because it has not been sent on our account, this will be down to you.